Factions and Busy Work #WoW – Nomadic Gamers, eh! In pretty much every MMO I have ever played, there is ‘busy work’ to keep you logging in. A few years ago it became dailies and with Pandaria (at release) pretty much ALL busy work was dailies. It became a boring grind for me and was one of the main reasons I quit. Logging in to complete 20-30 dailies was just not my idea of fun. These days there is a lot more to do – but I regret not doing those dailies back when they were relatively fresh. There are a few factions I really need. One is Shado-Pan. I need this to purchase a few enchanting recipes, like the weapon ones I want. 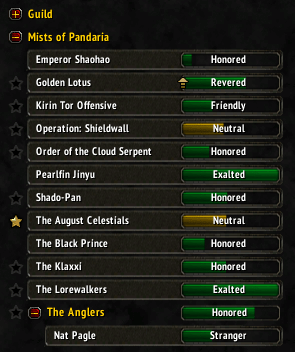 This faction isn’t too bad because I only need revered not exalted – but the dailies themselves are annoying. Another faction I need is August Celestials, and that one is also for some recipes. I have also never finished faction for the Anglers, nor for the folks that sell serpent riding (Order of the Cloud Serpent). That’s right, NONE of my characters, even my main, have this skill. The problem is I still hate dailies, especially when it comes to completing them on multiple characters. It’s a bother for me to remember to do my crafting dailies, let alone the multiples that are involved in farming and every other faction under the sun. While it may be a successful method in getting players to log in daily, it is one of my least favorite things to do in game. How about you, do you enjoy logging in for dailies, or are they something you could do without? Let me know in comments! And Nat Pagle has a heart of stone. I helped him out in Theremore way back when, but now he treats me like a stranger! hah! I don’t mind daily quests in the right dose. I can manage one, or sometimes two, sets of dailies every day. I managed to do The Tillers and The Anglers at the same time. They were close by and the quests for The Anglers were pretty fast. Likewise, Golden Lotus was pretty quick, so long as as skipped that one big “go find/kill a thing” quest. The Cloud Serpents were fast dailies, a crafting focused at times. And, of course, The Lorewalkers was just a treasure hunt you could do in a couple of hours with some help from the web. Right now I am working on the Shado-Pan as well. Those are tough enough that I am only doing those every day before going of to do other things. The thing for me is that all of the factions have some mounts when you reach exalted, which is exactly the right bait to get me to press on. Personally, I hate dailies. To me they always felt like lazy design that, as you said, only serve to keep people logging in daily and busy, often with a reward that is not all that worth the trouble. For instance, Everquest 2 became so badly on that regard that I got burnt out and had to take a break. Now the only dailies I am doing are the apprentice ones (since I still have some crafters I want to raise and those potions of progress are nice), the daily adornment (since the alternative is even more horrible), and the loyalty token ones (because it is pretty much stuff I would do playing normally anyway). Even those I am still thinking on the best ways to spend less time doing them and more time doing fun stuff!